How does the Hearing Loop System work? Hearing Loops consist of three basic parts – an amplifier, microphone and thin loop wire. The loop wire is run around a room or auditorium, connected to the amplifier which is then routed to a TV, PA system, radio or microphone. The Hearing Loop technology uses a magnetic field to wirelessly transmit audio to a person T-Coil enabled hearing aid or cochlear implant, or a Hearing Loop receiver with earphones. The t-coil in a hearing aid is smaller copper coil that picks up magnetic field from the loop and converts it into electrical energy. By switching the hearing aid to the “T” position, the electromagnetic field is detected. The Hearing Loop technology and installation have existed for many decades, there is new technology, new configurations and a renewed national effort to encourage and promote the proper installation and use of loop systems. Hearing Loop solutions offer individuals with the “invisible disability” of hearing loss the ability to experience full and rich audio interactions in just about any setting. Users can enjoy a discreet listening experience without background noise, competing sounds, reverberation, or other acoustic distortions that reduce sound clarity. There are now six different loop configurations or layouts that can be applied using today’s modern technology. Each is engineered to comply with the specific needs and applications of various venues. If you are interested in getting a custom quote, visit our contact page and send us an email. We will response quickly and discuss your specific needs. 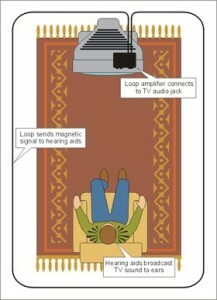 This entry was posted in hearing loop and tagged amplifier, hearing loop, microphone by admin. Bookmark the permalink.